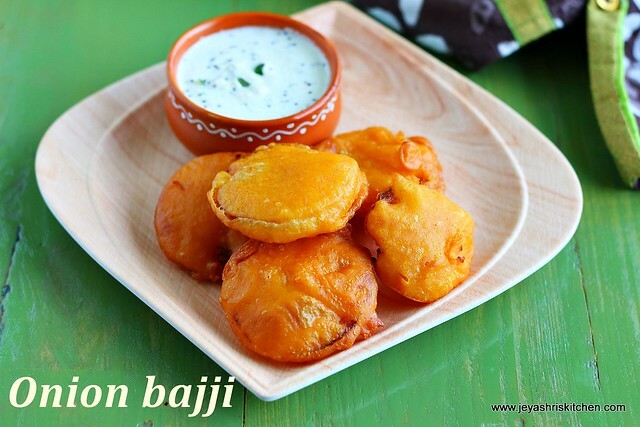 Onion bajji | South Indian style vengaya bajji is a deep fried onion fritters. They are dipped in a flour batter and deep fried in oil. Bajjis take place in our home very rarely but when we were kids bajjis are made on all Sundays. Amma used to make Vazhakkai bajji often as we get fresh home grown vazhakkai(raw banana) always from the garden. Also kathrikkai(eggplant) bajjis are our most favorite ones too. We feast on bajjis and skip our dinner or just drink some buttermilk and sleep off. Onion bajjis are made rarely as amma makes it whenever there is some extra batter left over. That too she will finely chop all the onions and mix it with the remaining batter and fry in the oil. 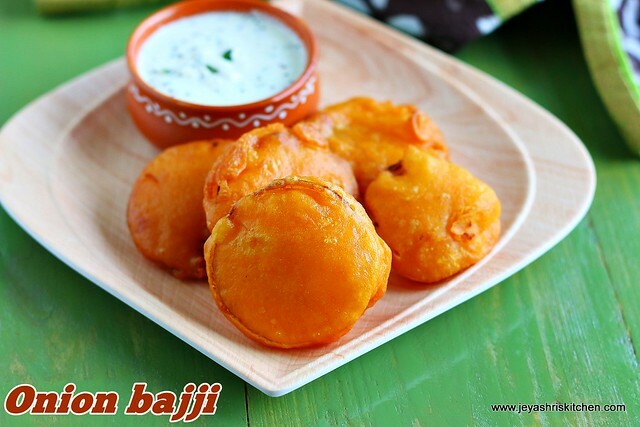 It is more similar to the north Indian style onion bhajiyas. We love to eat this with curd rice. When i called up amma yesterday that i am going to make onion bajji for post, she told me to try out bajji by soaking channa dal and rice. The procedure is to make a thick batter out of this and make bajjis with that batter. My appa's mami sued to do this and she told it would taste awesome. But i didn't have time for that as i already kept everything ready to take video of bajji. But will try this method and post the recipe soon. Slice the onions into roundels without peeling the skin. Once done, take out the skin. In this way the onions will be cut perfectly without any mess. Gently wash it and and keep aside. Soak the asafoetida in 2 tblsp of water. You can add the asafoetida to the flour directly but soaking brings out more flavour. In a bowl add the besan, rice flour, red chili powder, baking soda(if adding) salt and asafoetida water. Add water little by little and make a medium thick batter. Do not make it too thick, the outer cover will be hard and there will be more batter than the vegetable. Also do not make it too thin, else the veggies will not get coated with the batter. Heat onion in a pan. Once it is hot bring it to a medium flame. Add 1tblsp of hot oil to the batter. This is to avoid the bajjis absorbing lot of oil while frying. Mix well and dip the sliced the onions in the batter. Gently drop this into the oil. Take out from oil and drain in a kitchen towel. Serve with coconut chutney or lemon pickle. Ensure the batter is not too thick or thin. Always fry the bajis in medium flame else it will get cooked on the outside fast. Do not cook the bajjis if the oil is not hot. It will become soggy and absorb lot of oil.